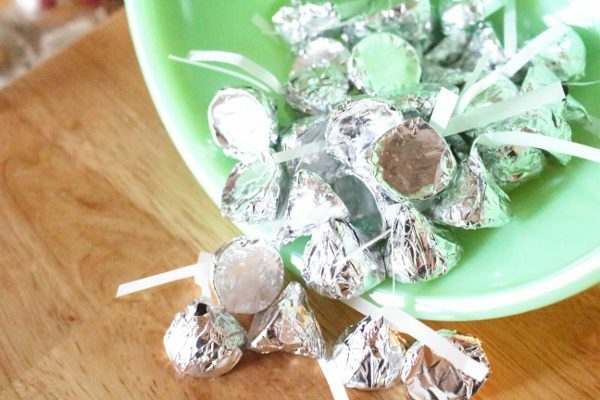 Skip the processed ingredients with these homemade chocolate kisses. Honey sweetened chocolate wrapped up in a little foil is the perfect way to say I love you! These DIY chocolate kisses are Paleo and GAPS friendly, sugar free, vegan, and have so few carbs that you could even eat a few if you are following the keto diet too! I have a holiday tradition. It’s been a tradition since college (which was more years ago than I care to admit), and it’s a tradition to this day… though it has changed a little bit. I inherited the beautiful green vintage, glass bowl you see above from my grandmother when she passed away. It was one of my favorite pieces that she owned and so my mother let me have it as a keepsake. And I thank God every time I pull it out to use that my stupid 18-year-old-self didn’t break it in my college apartment! Anyway, the tradition… Each holiday I would buy a seasonally appropriate candy and fill the bowl to the brim. It’s a larger bowl that it seems, holding 2 large bags of M&M’s easily. At Christmas is was red and green M&M’s, at Easter it was chocolate Robin Eggs, and during Halloween it was dark chocolate Reese’s Peanut Butter Cups! For many years I continued in this pattern until I found out what’s actually in all those things that I used to love. Yuck! 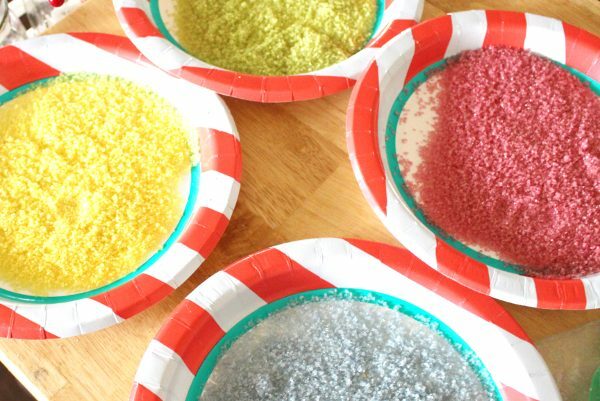 So, we started making our own clean candy and we haven’t looked back since! 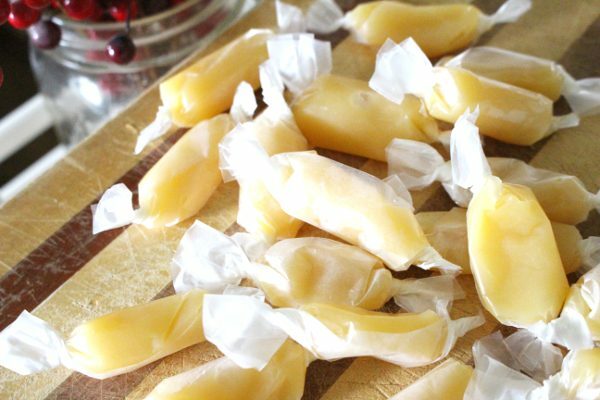 Making homemade chocolate candy (and candy in general) is a hobby of mine. You should see my chocolate and candy molds cabinet… it’s a little insane how many I have! But once you know how to make high quality tempered chocolate at home, you’ll never go back to store bought! 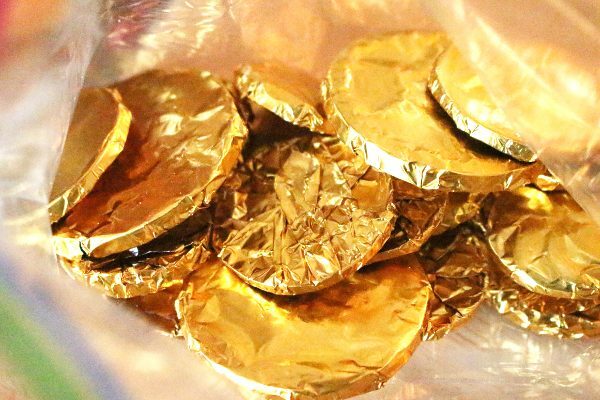 Last year I tried my hand at foil wrapped chocolate coins (which turned out so well!) and then immediately afterwards I knew I needed to try homemade chocolate kisses! This recipe is a little different from my other honey sweetened chocolate recipes as it uses black cocoa mixed with cacao. The result is a rich, very dark chocolate! Melt cocoa butter in a double boiler. Remove from heat and stir with a wooden spoon for 2 minutes. Add cocoa, cacao, honey, and vanilla. Stir until smooth. Whisk at this point, if needed to remove lumps. Pour into chocolate molds. Here are the chocolate kisses molds that I use! Allow chocolate to set up at room temperature for 2-4 hours, depending on the heat of your kitchen. Do not put them in the fridge as this can cause blooming to occur (white spots on the chocolate). 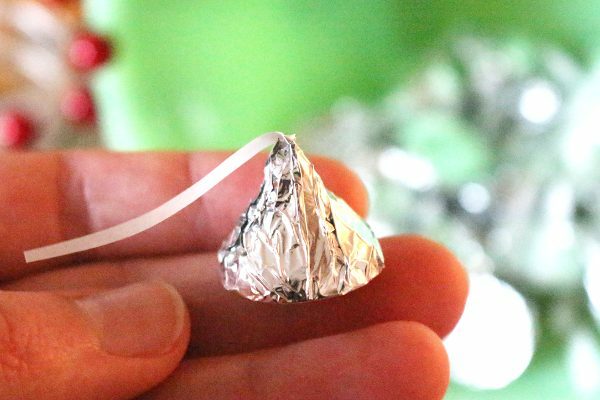 Traditionally, chocolate kisses are wrapped in silver foil with a little white paper tassel coming out the top. I chose to re-create this traditional appearance, but you can do whatever color combo you’d like! The candy foil that I purchased had tissue paper pieces between each sheet of foil. That is what I used to create the kisses “tails”! Win! 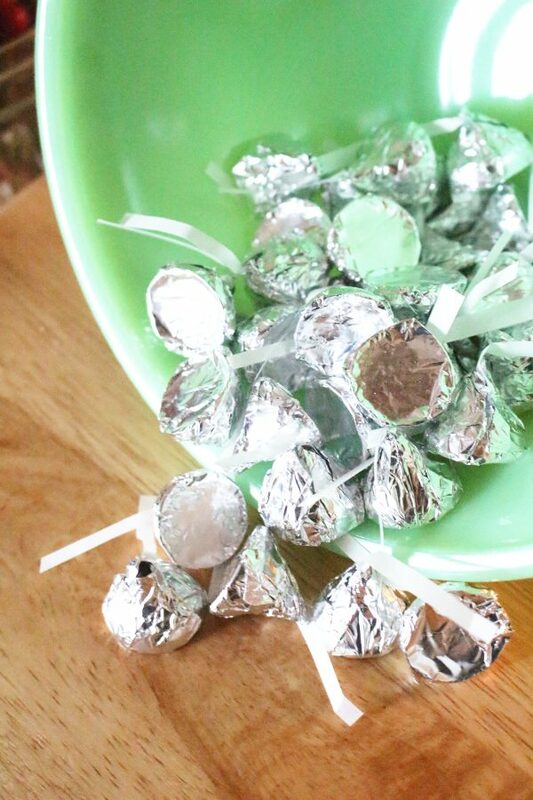 Simply cut the tissue into thin strips and place under the kiss before wrapping in the foil. If you want to print on the tails or use a different color, experiment with printing on tissue paper and then cutting it into thin strips. You *can* use non-tissue, but thick paper doesn’t flow the same way that the thin tissue does. Cut the 4 inch foil squares down to about 2.5 inch squares and place the tail end and kiss in the center of the foil. Pull each corner to the top of the kiss, then tuck in the edges that are sticking out still by running your fingers in a counter-clockwise motion at the top of the kiss. If you use a different mold that the one listed above, your foil size may need to be changed as well. So, cut and test one sheet before cutting them all! Add cacao, cocoa, and honey. Stir well. Pour into squeeze bottle for easy transfer to chocolate mold. Fill molds fully, allow to sit at room temperature until hardened. Remove chocolate from mold by pressing on the tip of the kisses and releasing it towards the backside. Store at room temperature for up to 6 months! O my gosh! I know some diabetics that are going to be sooooo happy! Awww, thank you Norma! I hope they love it as much as we do!